And I’m not talking bout how much sales you have and what’s your expenses. Those numbers are too general. You will have to look deeper if you want to make informed decisions on what’s needed to take your business to the next level. In the startup world, many entrepreneurs are familiar with the Pirate Metrics, a customer lifecycle framework invented by Dave McClure (former CEO of 500 startups). 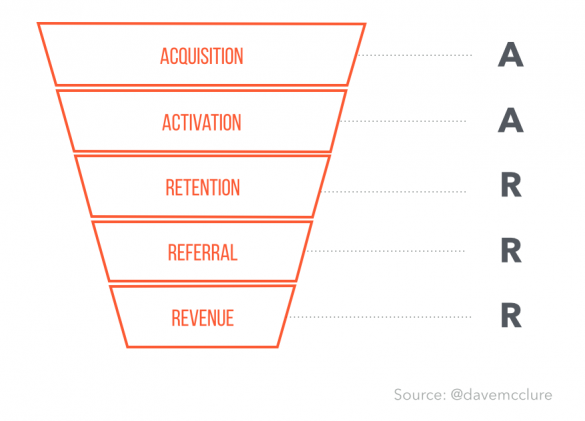 Named after it’s acronym AARRR which stands for Acquisition, Activation, Retention, Referral & Revenue, this simple framework can help you figure out what metrics to track in your business. How are you acquiring potential customers? The first thing you need to track is how are you reaching out to potential customers and how well it is converting. You may be running campaigns or doing a road show. Whichever channels you are employing, you have to track if it's working. If you are running a lemonade stand, you may go around the neighbourhood, handing out flyers to attract those who may be thirsty for a drink. To measure how well the flyers are doing, you could give a slight discount to those who present the flyers when they purchase a drink from you. The important thing is to figure out how much you are spending to acquire a customer. Your Customer Acquisition Cost (CAC) is the crucial metric as it will inform your marketing efforts and how much you are spending. In this case, your CAC is the cost of printing the flyers and your effort handing them out. What does it take to get them to make their first purchase? Once you are able to get someone's attention, your next challenge is to turn them into a customer. You will want to know what's the percentage of people who came actually bought a lemonade from you. More importantly, you must find out exactly why someone who drops by decides to buy that lemonade. You could simply ask them why they prefer to buy from you instead of your competitors. Conduct a survey and get their feedback. By knowing why some customer make a purchase will help you convince the rest to do the same. Your aim is to increase the percentage of potential customers turning into actual customers. The more potential you can activate into real customers, the better. The best customer is the one you already have. And the best way to grow a business is to be able to retain your existing customer base. This is why retention rate is extremely important. You will want to figure who are your repeat customers and find ways to incentivise them to stick around. On the flip side, it is also useful to know why aren't some coming back for more lemonade. A common way to get customers to return is to give them something for their repeat business. You can offer a free lemonade if your customer have previously bought 9 of them. A simple card and stamp would do the trick. What are you doing to make it easier for them to refer others? Every marketer understand the power of word of mouth. It’s more effective and cost efficient so your business should leverage it whenever possible. Basically, you want to make it easy for your current customer to refer new ones. You can setup a referral program where you incentivise your customer to bring their friends and enjoy lemonades together. Maybe you could give them both discounts or award certain points to your customer that they could convert at a later time for more lemonades. Make sure you are measuring how well your referral program is doing. It will also help if you have a clear understanding of your profit margins so you won’t be giving more than you can actually afford. Is there anything else you can sell them? The last part of the lifecycle is to focus on increasing the customer's life-time value - LTV. This metric reflects the total number of revenue a customer will bring on average for the entire their lifetime. If you have a lot of regular customers, your LTV will be higher than a business who only sell to a customer once. This is why it's important to focus on retention and referral as they will directly affect your LTV. Once you have this number, your job is to increase it. Start thinking how to increase the value of each customer by providing different revenue streams. For example, you can start selling some snacks at your lemonade stand to boost your total revenue. If you have been paying attention, you will realise the 2 key metrics to track are your Customer Acquisition Cost (CAC) and Life-Time Value (LTV) of your customer. By understanding exactly how much it cost to acquire a customer and how much on average that customer will bring to your business, you will be able to make informed decision on how to grow your business. As long as your CAC is below your LTV, you can reinvest your profits to grow your business. Else you will be stabbing in the dark and may end up losing money despite growing your revenue. If you have a business and aren't sure how to grow it, start being a pirate and track these metrics. Feel free to reach out if you need help analyzing your metrics and I wish all the best in growing your business. Found this article useful? Please take a minute and share with your friends. Also subscribe to my blog for more insights on business and startups.